Last month we looked at ways to keep your property safe from burglars by taking a virtual walk around your home and focusing on tips and tricks to make it less attractive to burglars. For a quick recap here is that article. 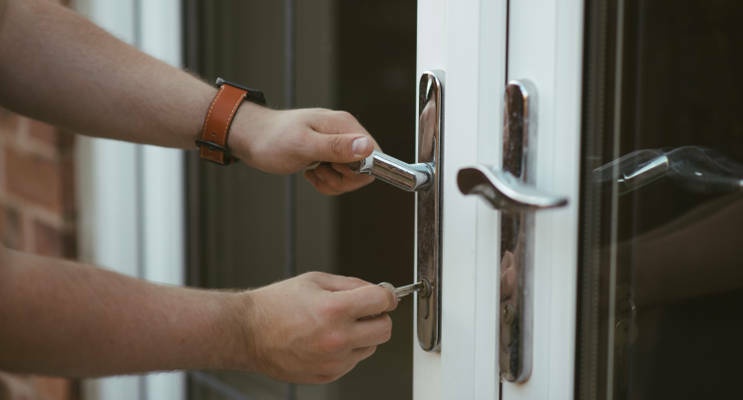 This month we take it one step further and take a closer look at the tools you can use to secure your doors and windows to make it harder for burglars to break in if they do decide to take their chances. A door’s main weak spot this can be kicked in order to gain access to your property. Reduce the chances of this happening by reinforcing the strike plate with three-inch screws and a reinforcing plate. You can do this by buying plate-reinforcing hardware and either installing it yourself or getting your local handyman to do it for you. If your dead bolt was installed in the last decade then you can rest easy as it will already have that in-built extra security. With options ranging from the simpler heavy-duty metal bar that screws through the door and frame holding it in place to the more sophisticated foot locks that fasten to the bottom of the door and lock by fitting a grommet into the frame, there are plenty of options on the market. Choose one that is right for your budget and which fits in well with your existing door furniture so that it is as inconspicuous as possible. There is a wide range of window restrictors on the market at the moment. They include cables, hooks, arms, and plates that will allow you to keep the window cracked open to allow for ventilation without compromising your security. They also have the added benefit of acting as a safety net for homes with young children as the opening is too small for them to escape from and fall. These can either be used in addition to restrictors or instead of them if you do not need to allow for extra ventilation. Products such as sash jammers, lockable frame guards, and hinge protectors work as additional locks on your windows making it that much harder to break into. If your door doesn’t have a peep hole then you can install one. Make sure to opt for one that gives you a wide-angle view so that anyone trying to hide from sight will still be visible. For those windows that are used less frequently or which are in darker spots at night you can install an individual alarm. They operate by using a magnetic strip that emits a high-pitched shrieking noise if the seal is broken. Keep in mind though that this will not work if the glass is broken as a way of gaining access. For best peace of mind against burglars consider installing an alarm to protect all entry points to your home. Our DNA Systems team is here to advise and help you find the right alarm system for your home. Just call us on 01424 718 844 for a chat or to make an appointment.